By Mustaza Mustafa in Mobile. Updated on November 13, 2017 . Typing on iOS device is an almost flawless experience – until the autocorrect function spoils everything, sometimes making a joke out of something when it wasn’t your intention in the first place. Speed typing in iOS is almost impossible when you need to type words that are not in the dictionary used on the iOS, and often times an autocorrect popup will appear suddenly, interrupting the delivery of your message. In this article, you will find a short and simple trick on how to avoid annoying autocorrects on your iOS devices. 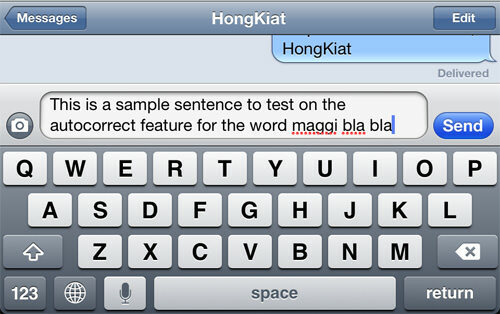 Type a word that is not found in the dictionary, to make the autocorrect appear. 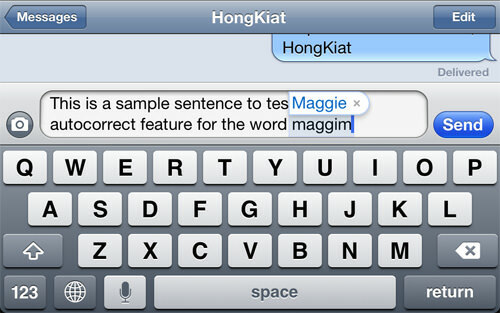 In this example, we use the word ‘maggi‘. Don’t hit space just yet, but continue typing an extra letter at the end of the word. Now delete that extra letter, and notice that the autocorrect has disappeared. Hit space and continue completing your sentence. That’s it! It takes some getting used to but after awhile, it will come naturally to you. Type faster than before without being annoyed by silly autocorrect popups ever again!